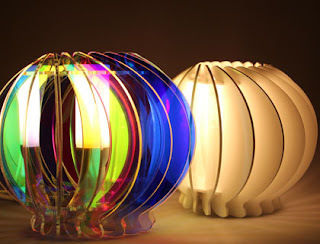 Trotec Laser Online Magazine: Design an Acrylic Lamp with Your Laser! Design an Acrylic Lamp with Your Laser! Looking for a unique housewarming, birthday, or Christmas gift... or maybe just to add some character to your own decor? This is an easy project that is sure to turn some heads, as the construction of the acrylic lamp provides a marvelous light reflection! Open the template file for this extraordinary piece of furniture (for download click here) and send it to the laser. Select your favorite color and start cutting the acrylic. The laser parameters may vary, as they depend on the machine used and the available laser power. 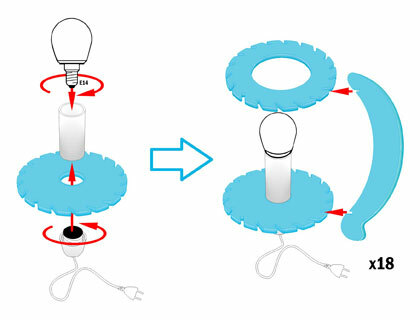 To fit in the socket of the light bulb, emboss the edge with cutting lines. This is an alternative to engraving the area. Thanks to the de-focussing, the laser beam is wider and the cutting lines overlap. That's how the "engraving effect" can be done with cutting lines.